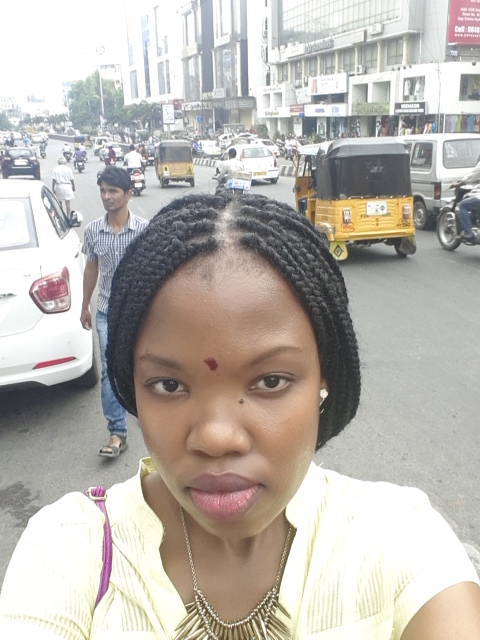 Another travel #TBT, this time I went to Hyderabad, India for a wedding. I took this trip in August 2014 along with my friend Danna. It was both our first time in that side of the world. Enjoy. A couple of weeks ago I travelled to the sub-continent aka India, it was my first time in the East and I was totally looking forward to the trip. Let me back track…while I was living in Switzerland last year, I met this Indian girl in my lab and we just clicked and were close friends, so when in January she told me that she was getting married in August, I knew I had to get my behind to India for the weeding because 1) I had never travelled that way before and 2) it is always a bonus to go somewhere and there is a function of sorts, you get to learn so much more about the country and culture – and a wedding is the best way to do that. 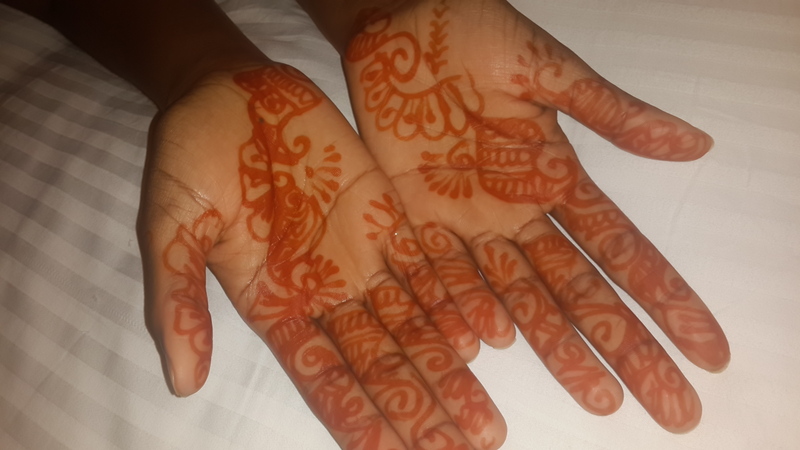 The journey was looooong – it took me over 24 hours to get from Durban to Hyderabad (the city where the wedding was to be held). 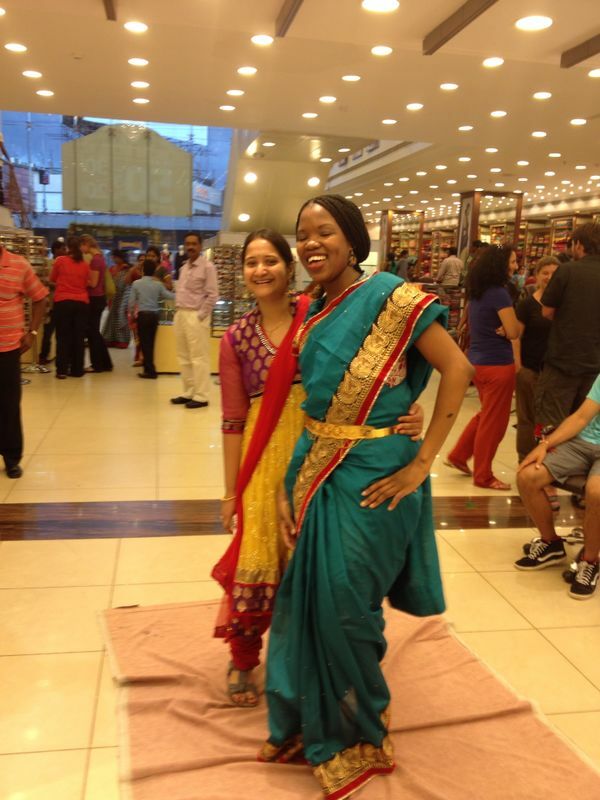 I travelled from Durban to Johannesburg, where I met up with Danna – and from then we did Johannesburg to Dubai (my first time in Dubai as well), Dubai to Mumbai (where we got a first taste of India) and finally Mumbai to Hyderabad. We were so tired we slept for about 12 hours on our first night in India, it was well worth it though because afterwards we were ready to roll! Prior to arriving in India I had asked my friend what clothes are ‘acceptable’ to wear in India and she had told me that strictly: no leg is to be shown (if you know me, you know that this was a major bummer), cover the shoulders, no tight clothes so basically just be covered up. So packing for this trip for me was so hard and very uninspired – I only really started packing 2 days before and I had a very empty suitcase. So Indian weddings are long (there were ceremonies each day for 4 days before the actual wedding) and very involved (we needed outfits – so due to the clothing restrictions I basically had to buy clothes in India to wear during the day and to the functions – this was cool though because clothes are cheap in India and I really enjoyed wearing the kurtis. One thing you can’t go to India and not talk about is the transportation system and basically the traffic and roads situation. There are a LOT of cars, buses, motorbikes and tuk-tuks on the road and I mean a LOT, and they are all driving as they please and hooting to no end. I don’t normally complain about noise but it was NOISY all.the.time! Basically people hoot to tell other cars that they are coming up behind them, they hoot when they are turning, they hoot when they cut in front of you – you get the drift. We used tuk-tuks as a main mode of transport, and let me tell you that a tuk-tuk ride in India is like no other – we would be screaming the whole time because the driver has pulled a crazy move on the road or has nearly bumped someone or another car has nearly bumped into us. Tuk-tuks drive so close to other cars that you can put out your hand and touch the car next to you while you’re in traffic. 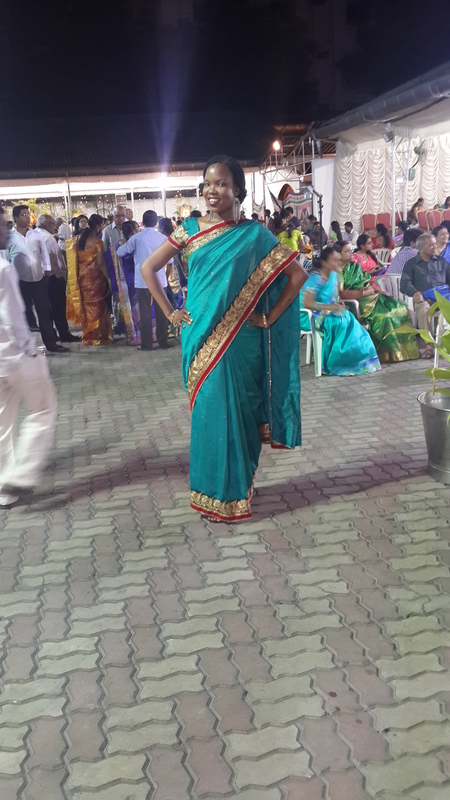 So for the actual wedding – we chose to wear saris just to tie up that traditional look. 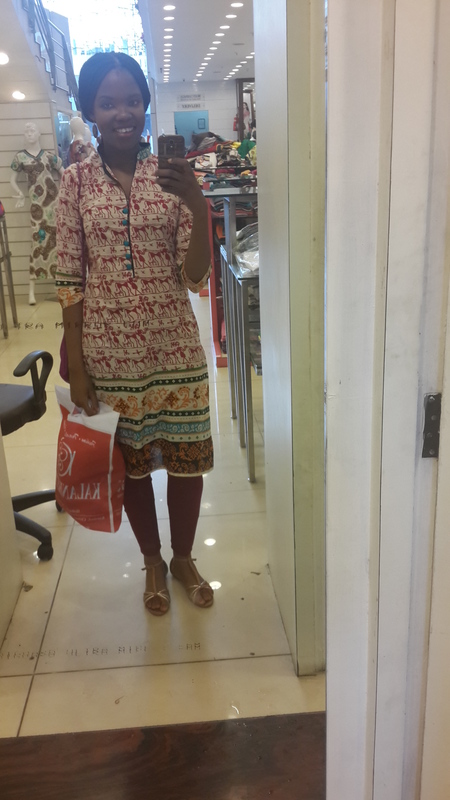 So we went shopping for saris on a Sunday and the wedding was on a Thursday, the way I thought that buying a sari just meant picking it up off the rail and going to pay – I was so so wrong! 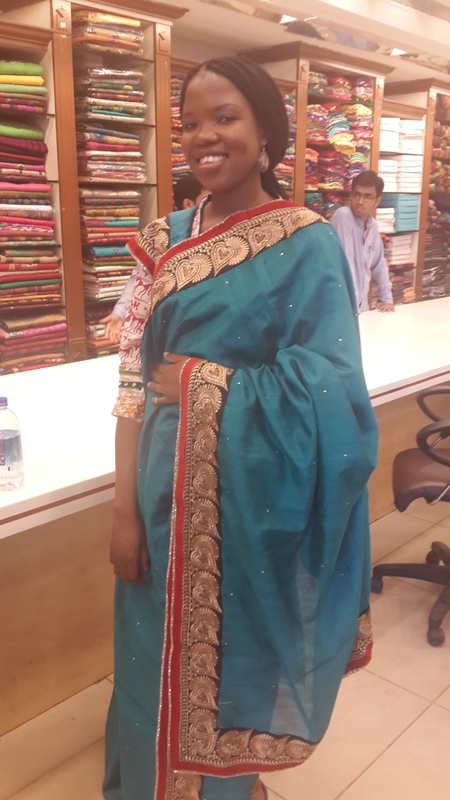 First we had to choose the fabric out of thousands – there is truly no shortage of designs in India at all! After I finally settled on a bluey fabric with red and gold trimming, we had to be measured so they could make the little crop top thing with sleeves that is worn under the sari. The saris were delivered to us 2 days later. Final look at the wedding – I felt so glam! The food in India was spicy hehehehe as expected of course, what I liked is that whenever we asked for a bit less spicyness than usual, most of the restaurants obliged. Apart from being spicy it was deeeelicious! 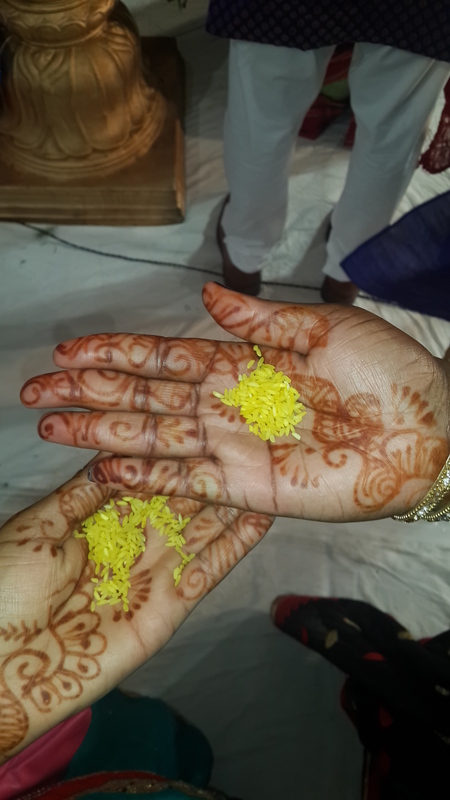 like really yummy – for the wedding functions we ate only vegeterian and I realised that vegeterian done well is really good, apart from the wedding we had lamb, chicken, fluffy basmati rice, garlic naan (my all time fave! ), biryani (a Hyderabad special). One thing I noticed was that India Indian food is so different from South Africa Indian food (if that makes sense), so like India biryani is different from what I am used to here at home. 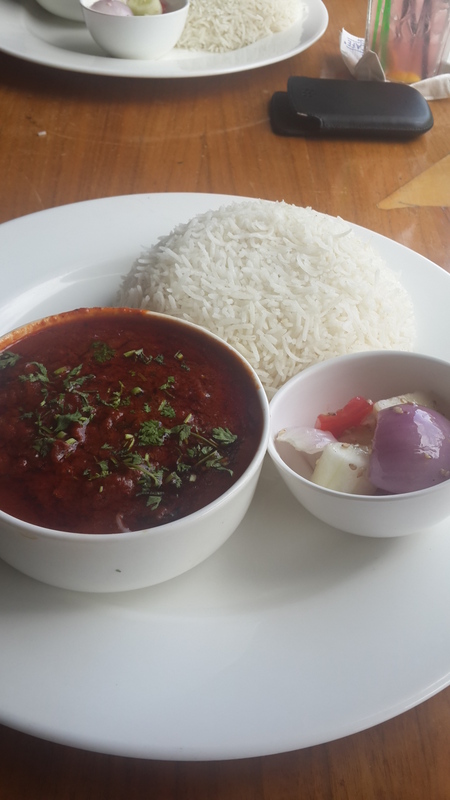 Lamb curry and rice that we had at NewsCafe in Inorbit Mall – we were so excited to see NewsCafe in India! 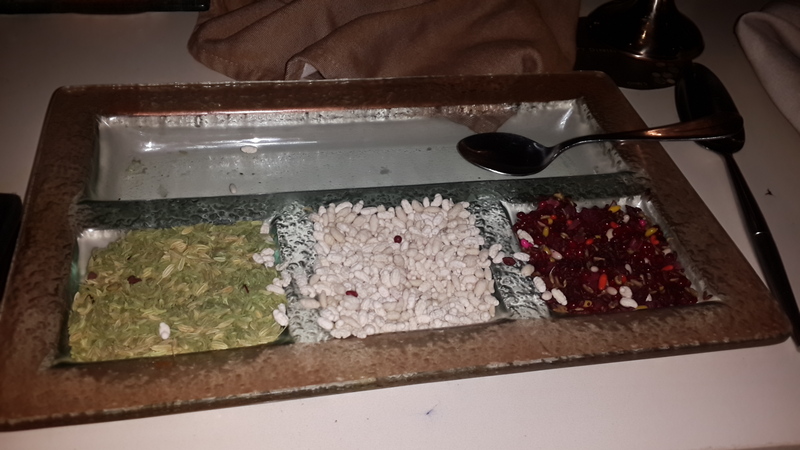 Seeds used to help with digestion of spices after you have a meal – so yum! We went into the grounds of a mosque and we had to completely cover up – even the kurtis were not enough. Women are only allowed in the ground and not inside the mosque. 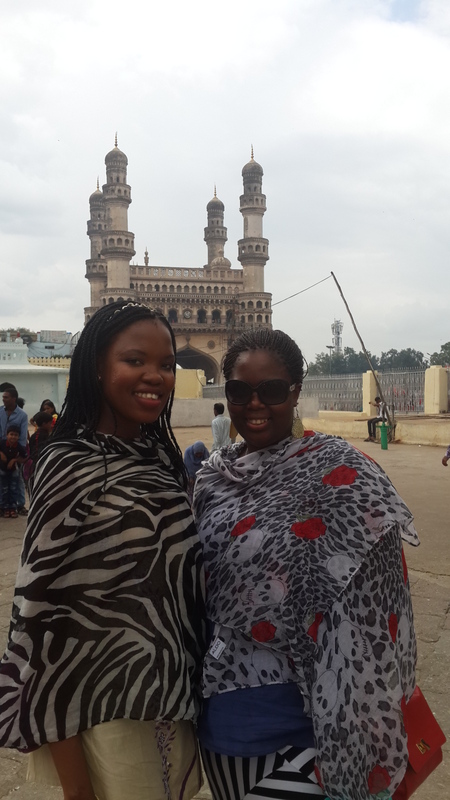 At the back is Charminar – a famous monument in Hyderabad that we had toured. I like your saris! I hope it wasn’t as hot as I hear it gets in India !